This micro barbell features two removable 3mm balls on each end, which can be removed and replaced with any other threaded accessories that also have a 1.2mm gauge (thickness). The titanium micro barbells are small and versatile, used for any 1.2mm thick piercing (this may include piercings such as ears and eyebrow) providing the size fits your piercing correctly. A popular choice of accessory is a micro jewelled ball on each end of the bar, also available to purchase separately. I got this in 8mm for my cartilage piercing and I'm very happy with it. It fits longer than necessary, but I was afraid 6mm would be too short. It's also a lot more shiny than on the photo, but I don't mind. 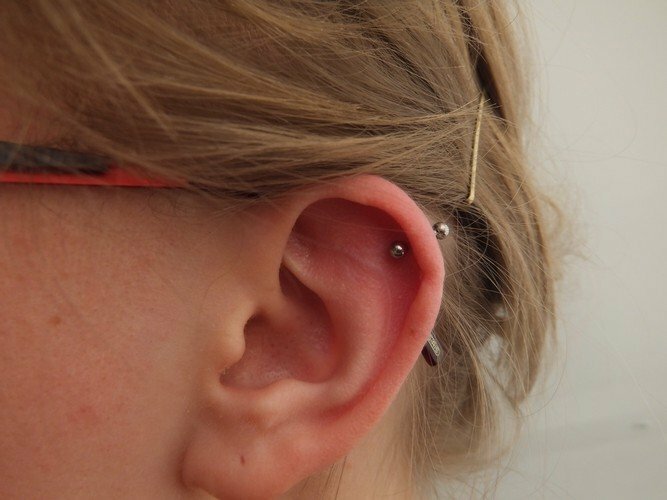 Bought this for my odd third piercing as it nicked the cartilage so it's sensitive. Got the 6mm which is perfect considering it's a thickish piercing and there's still a bit room. Tiny bit tight when I first put it in but fine now. I got the SS jewelled micro balls to wear with it and it's the perfect small size and the perfect earring. I bought a couple of these in different colours for my lone piercings cos they're more comfortable without spiky backs of other earrings. The titanium is really cool cos it's not too plain, it looks a lot darker than the picture but it's good. Got a purple one aswell, which looks cool. I agree that 8mm might be a bit long for lobe piercings but I didn't want a 6mm to be too tight cos my 3rd lobes are sensitive. Bought for my cartilage piercing, as I was looking for something discreet. I love it! I bought 4 of these for my lobes since the back of normal earrings always digs into my neck. I bought them in 8mm length which is slightly too long, therefore I would recommend the 6mm for lobe piercings. I bought this for one of my cartilage piercings in my ear and it's pretty hard to find a 1.2mm titanium barbell. It would be nice if they did other colours too. I ordered the micro barbells for my eyebrow piercing, and I am definately satisfied with them! They make my piercing stand out, without drawing too much unnessary attention that the 5 mm balls tend to bring!